Brands are spending A TON of money on influencer marketing these days. We're talking to the tune of $10 billion dollars expected in the next five years. Whether it's free trips to exotic destinations around the world or charging for a promoted Instagram Story, leveraging a following on Instagram has become a lucrative way to be your own boss and earn money online. 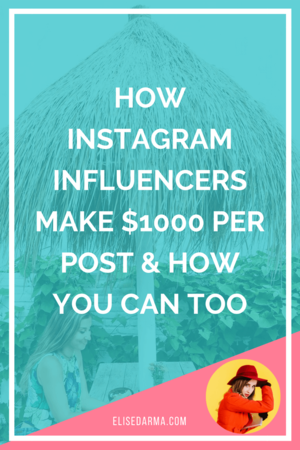 Not sure how to turn your Instagram influence into a side hustle or a full-time business? Here's my ultimate guide to becoming an Instagram influencer and getting paid. Instagram has over 800 MILLION monthly users. You need to speak to ONE specific person and create a tribe around one main topic. By dominating a niche on Instagram, it won't matter if you have 3,000 or 300,000 followers. What you will have is a highly engaged audience that trusts your opinion – and that's the type of influencer brands want to work with. The quality of the content you put out there will determine if people like, comment and follow your account. A blurry selfie or a dimly lit food picture doesn't typically attract droves of raving fans. But if you share high-quality (read: non-pixelated, aesthetically-pleasing) images that inspire, educate or entertain people? Now we're talking. If you want your account to grow, you need to invest in a decent smartphone or DSLR camera, and spend time taking photos that have a solid composition, good lighting and are in focus in all the right places. But your work doesn't stop there. You also need to make sure that you write engaging captions and use the right hashtags to attract your ideal follower. You can learn more about how to do these things effectively in my free masterclass: 3 secrets to gain 1,000 Instagram followers in 30 days. The number one thing that sets influencer accounts apart from the general masses is by having a consistent aesthetic. A cohesive feed helps your audience know what to expect from your account with a quick glance. It also increases engagement by keeping people on your feed longer as they'll feel compelled to like more pictures as they scroll down your feed. When you start working with brands, your engagement statistics play a big part in you landing that paying gig. Find a feed design that works for you (meaning, you can stick to it consistently) and start standing out from the rest. Instagram's algorithm rewards accounts that post consistently. Because Instagram wants people to be consistently using the app, and accounts that help it achieve this goal get pushed up higher in the newsfeed. Whether you decide to post multiple times a day or each day, you need to stick to your schedule. Use tools like Later or Planoly to plan out your feed for the week. By taking an hour out of your day to curate content for the week, write your captions and choose your hashtags, you'll start to see an increase in engagement and followers. The most successful Instagram influencers don't post a photo and log out of the app. Instead, there's usually a question in their caption, and they spend time replying to comments, DMs and engaging with other accounts. This helps to create a stronger sense of community around your brand and turns casual swipers into super fans. Posting a poll in your Instagram Stories is another way to increase engagement with your followers. Ask their opinion on where you should travel next, what you should wear, or what photo they like best. Instagram rewards you for creating content that receives replies, DMs and comments from your followers! Asking for feedback from your followers is an excellent way to understand what makes them tick while strengthening their relationship with you and your brand. You know that saying, "It's not what you know, but who you know"? This kind of applies to Instagram. While it's possible to grow an account all by yourself, collaborating with other people will make the process easier and faster. You'll also be able to network within your niche and come across opportunities you may not have heard of otherwise. Spend some time going through your favourite hashtags and finding similar accounts. Engage with their content, start a conversation and who knows – you may even end up meeting and collaborating in real life. Collaborating and hanging with @tekwani in San Diego. Once you've grown your account to 1,000+ followers, it's time to start reaching out to brands in your niche. Don't be scared to start pitching if you're a small account. If you have an engaged following and it's the brand's target audience, you stand a good chance of landing the opportunity. P.S. Did you know that I pitched a brand with just 5,000 followers and received a week's stay for free? Spend some time crafting the perfect pitch and detailing what you can offer them. I know it can feel awkward at first, but the more you do it, the easier it gets. And at the end of the day, the worst thing they can say is no, right? Want even more step-by-step actionable advice for turning your Instagram account into a money-making machine? Sign up for my FREE Instagram Masterclass and learn my top three secrets for gaining 1,000 in just 30 days.